Luxury Travel in India? Opt for the Oberoi Experience! One for heritage, one for adventure, one for architectural splendor… and all of them steeped in luxury and magnificence. It’s no surprise that The Oberoi Hotels has just bagged the Travel + Leisure USA magazine’s Reader’s Choice Award for world’s best hotel brand! 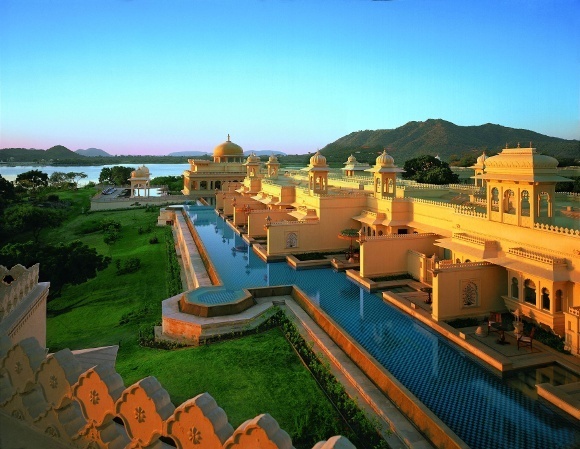 Here’s our selection for those looking to experience luxury travel in India, Oberoi-style. Visiting the Taj Mahal, in Agra, North India, can be an overwhelming experience of crowds of people, combined with your heightened expectations of one of the wonders of the world – not entirely enjoyable if you’re planning private travel to India! Once you’ve soaked in the architecture and grandeur of the Taj complex, you might want to reflect on it at leisure. What better way than soaking in a hot tub and allowing the exhaustion of the day to drain away as you gaze into the Taj at a distance? 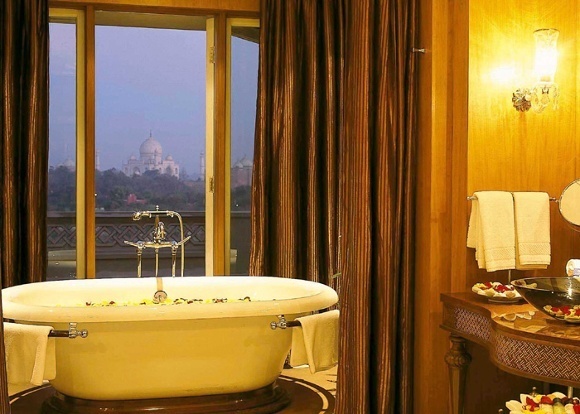 Every room at the Oberoi’s signature The Oberoi Amarvilas property enjoys a view of the grand Taj Mahal so that your entire time at Agra can be spent making the most of this glorious piece of architecture. Enchanting experience: If you’d like to experience what it’s like to imbibe syncretic Indian culture, finish your visit to this site of Islamic splendor with a Hindu blessing ceremony at Jodha Mahal on the Oberoi property. Come dressed in traditional Indian attire, and a priest will bless you in front of a Hindu deity, and direct you to exchange garlands and receive blessings as per Hindu tradition. Udaipur’s shimmering lakes and water bodies will mediate your experience of this vibrant Rajasthani city. Some of the city’s finest mahals and hotels rest on the banks of its gentle waters, tempting you to take a dip and lie back to enjoy the scenic buildings. You can actually do that in the grand pool at the The Oberoi Udaivilas. Anchored by two stately carved elephants, the pool’s blue waters are nestled against a view of the great lake just beyond it, and a dip will offer a majestic view of the surrounding buildings. Enchanting experience: Try a shikara ride on a beautiful boat on Lake Picchola, nibbling on canapés as the sun sets and the stars shine on the beautiful lake-side palaces. In Ranthambore, Tiger Country, you’ll likely find yourself awake as dawn breaks, eagerly awaiting your ride to take you on a morning safari. The jungles of Ranthambore are networked by scrubby dirt tracks, offering sneak peeks at hiding tigers, deer, bison and wonderful birds. If you’re making the adventurous journey into the jungle, you might well want to do it as comfortably as you can. The Oberoi Vanyavilas activities offer absolute luxury: plush jeeps with reliable drivers and trained naturalists will arrive to pick you up, carrying warm blankets and neatly packed lunches to take the roughness off the ride! 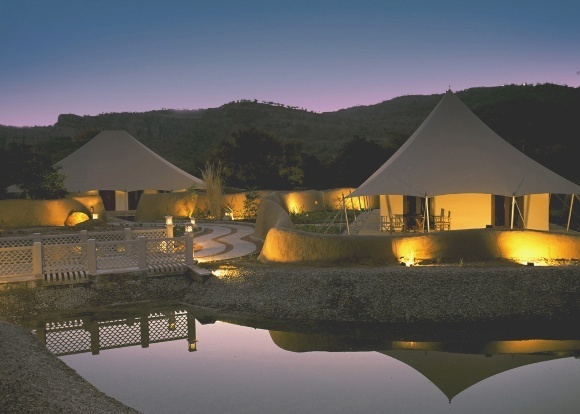 Enchanting experience: You’ll discover that the little village of Ranthambore is more than a base point to enjoy the jungle safari. For years it has boasted a rich cultural life as well; the Dastkar Ranthambore Project was established to help people in the region who lost primary access to wood and water owing to the rules of the National Park. By honing their inherent skills and crafts-abilities, Dastkar is able to help women become self-reliant by developing their traditional skills. Also home to the Ranthambore School of Arts, guests at The Oberoi Vanyavilas can request an interaction with a local artist. The Oberoi Wildflower Hall pulls out all stops to recreate the architectural splendor of the former Raj in the unabashedly luxurious Wildflower Hall. Formerly the residence of Lord Kitchener, this property is set high in the densely wooded mountains of Mashobra, near Shimla. Icy cold in the winter months, The Oberoi Wildflower Hall has been lavishly reconstructed to invoke the feel of the former British Raj. Enchanting experiences: To remind you that this isn’t just any old hotel, experience the region with your own local expert guide. A wonderful colonial heritage tour awaits! Wander around this former summer capital of the British: the Viceregal Lodge (formerly the Residence of the British Viceroy of India), the Mall, St Michael’s Cathedral and Gorton Castle are saturated with hundreds of years of history and your private guide will recreate their colonial splendor for you. 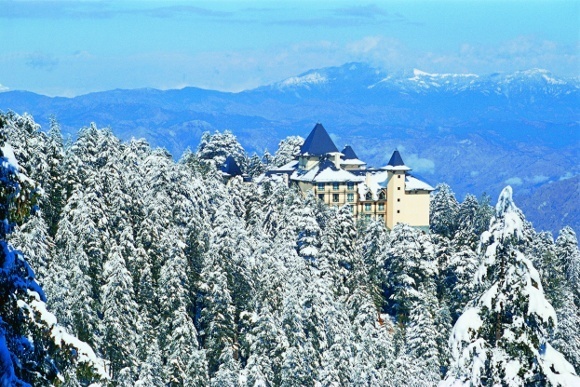 Alternatively, soak in the majestic views and trekking opportunities that Shimla can offer with a picnic. The Oberoi staff can book one of the lawns for your exclusive meal at The Peak, a quaint colonial bungalow perched on a hill-top in Shimla. They’ll lay out the spread and invite you to recreate the sentiment enjoyed by former Viceroys who enjoyed this 1863-built bungalow on their weekend retreats! If you are planning private travel to India, this is an experience you don’t want to miss. The Kerala backwaters, running through Alleppey, are famous for their leisurely houseboats, floating gently past villages and under a thick canopy of trees. Try a backwater cruise in The Oberoi style, in full luxury: on a cruise ship that allows you to languidly gaze at the waters by day and enjoy a luxurious meal and bed at night. The Oberoi Vrinda Houseboat is a perfect combination of a modern cruise with the look and feel of a large boat that wouldn’t be out of place in the backwaters! If you would like an Oberoi experience customized especially for you, take some inspiration from our many options here! We are happy to plan your luxury travel in India.